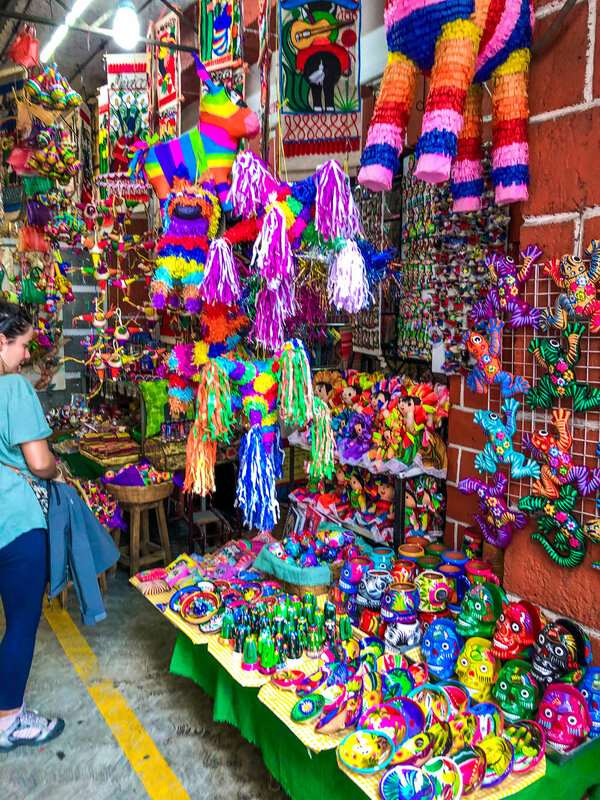 The Mercado De Artesanias La Ciudadela, located near the historic city centre, was my favourite market to shop for Mexican crafts and souvenirs. I've never felt so overwhelmed by colourful trinkets and found it almost impossible not to buy absolutely everything I saw here. The market is pretty big, so big in fact that we had to come back twice and even then, felt like there was so much we didn't see. Unlike other Mexican markets I've been to in places like Nogales and Punta Cana, I didn't feel like there was anyone chasing me down the hall for a sale or even hassling people to come in a visit their story. It was oddly calm and civilized and that's something I didn't expect. People were willing to haggle, but I think there is definitely a tourist mark up price you're going to get here. That being said, the prices are so cheap it almost feels bad to ask them to lower it any more than it already is priced. In some cases, we paid exactly what they asked because it seemed fair and in other cases, especially if we were buying multiples, we would attempt to haggle for a cheaper price. I want to make a whole post just about this market and what were my favourite shops but if I had to make a short list and pick a few highlights it would be the tin sacred hearts, the brightly coloured pom-poms and tassels and the richly embroidered tablecloths. Peletería Continental is one of those places which I feel almost hesitant to talk about since I truly think it's my the best place I found in my time in Mexico City. 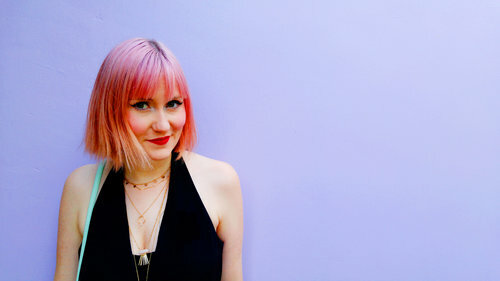 There is something about keeping it to myself that felt like I held a precious secret, but it's truly too cool to keep to myself. On paper, if you look up Peletería Continental you'll find that it's a just leather wholesaler. So why would a tourist want to go there? Well, it's not just leather they sell, and it's not just wholesale. 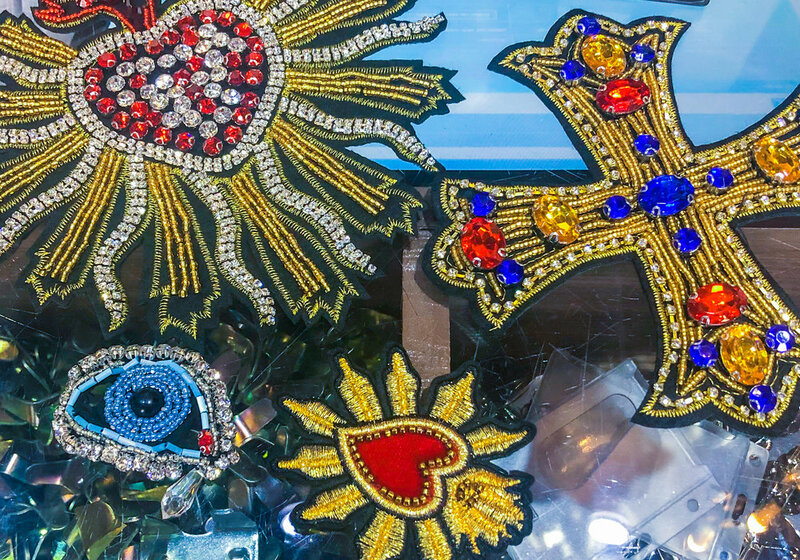 In large display cases on the outside of the store are beautiful pieces of embroidery and jeweled patched. There are dozens of other fabric embellishments like bows, rhinestones and more! These are meant to sold for wholesale, perhaps for clothing manufacturers and fashion designers but if you want to just buy one, that's totally ok! I was lucky enough to have someone in the store who explained the process in English to me, but in case you don't find an English speaker here is what you do. Write down the letter and number code of the item you're interested in. There is a huge tv sized iPad near the doors where you can input the item # and it will tell you the price in pesos per item. Then once you have the list of items you want and the number of each, just take that list to the counter and someone will go to find your pieces. They'll give you a total for all your items (which I think if you were buying in bulk you could probably haggle down) and you can then excitedly watch as the items are sent down in an antique style elevator from the stock room above. There were people buying thousands of items all around me and it was so exciting to be a part of. This shop has been open for years and remnants of the old world trading still remain. It’s like shopping with a side of history. Just down the street from Peletería Continental is Velas Cerería de Jesús. This seemingly small and unassuming candle shop is amazing. As soon as you walk in the doors you'll see tall candles hanging from the ceiling. Each one fantastically decorated with flower petals and blooms made from the wax. There are some which are almost 2 feet tall and are a rainbow of colours. Some look more like flower arrangement than candles. I purchased a few of the smaller versions which ranged from $2-$5! They packaged these up in boxes for me and I didn't have any issues travelling home with them. I also purchased some of their tall stick candles since I've never seen so many different colours at such a good price! 35cm candles were only 20 pesos, which is about $1 USD. Xinú Perfumeria is located in the high-end district of Polanco. When we first visited we thought it was closed but turns out you just need to ring the doorbell to unlock the front door. This store is mind blowing and visiting is an experience all to itself. When we first entered the entry room, there were framed pieces of tobacco on every wall. The smell of this gently roasted tobaccos filled th e room and beckoned you in further. From there you enter another room, so dark you can barely see. Xinú means ‘nose’ in Otomi. Otomi is a beautiful tonal language still present in various regions of Mexico. In so many ways your nose is what guides you to your destination here. On one wall sits a set of beautifully designed olfactory devices. You then climb a never ending set of stairs until you reach the top where you find the store itself. Inside the main room is a naturalist’s table. A naturalist’s table is used to observes, gather and collect elements from their natural surroundings. Here it is being used to display all the pieces of flora, natural to Mexico City, which are used in developing these unique scents. Xinú's philosophy is that it appeals to our individual olfactory memory. Their perfumes were all unlike anything I had smelled before and so rich, even a small whiff transcended me into another realm. Xinú is also very passionate about saving the environment from which so many of these natural elements grow, and without whom, these perfumes could not be produced. Their innovative bottle designs can be re-purposed into a vases or incense holders once the perfume has run out. My favourite scent was the UMMO. It was their newest scent containing absolute tobacco, jasmine tobacco flower, liquid amber resin and cedar essence. It was incredible but unfortunately, it was the one scent they had sold out of! I was pretty heartbroken but gives me another reason to return to Mexico City as they aren't available online just yet! Dulcería de Celaya, located in the heart of the historic district, is a tiny, old shop which has been selling traditional Mexican candies and sweets since 1874. Walking into the shop it feels like nothing has changed in over 100 years. When the family-run shop first started selling candy it was all made in a small, improvised factory using wooden shovels, copper saucepans and a minature oven. They could only produce so much per day, often only one tray of candy. But the candy was so popular that they would sell out day after day and as the demand rose, they managed to expand their production. Even today they produce candy in much the same way as it was made in that tiny kitchen. You walk in the door and the smell of fresh pineapples, strawberries, guavas and coconut fill the air. The candy is very well priced so even if you don't' recognize anything just let the smells guide you can just try whatever your eye is drawn to. La Casa Del Coleccionista in Coyoacan is a tiny antique store located right near Centenario Garden. This store houses precious treasures from years past and if you're looking for something for your home to bring back with you this is the place to go. There were so many old paintings, candlesticks and wall hangings which were incredibly charming and held within the memories of the past. While it’s nice to buy something new, an antique is a wonderful way of experiencing the Mexico City of year’s past and something you can’t just buy in any store. Each antique collection is unique to that one location and pilfering through their collections offers up singular treasures. Mexico is one of the world's best producers of coffee beans and while the coffee beans might not be grown in Mexico City, Mexico City is one of their best roasters. Coffee culture is a huge part of this city! In areas like La Condesa and Roma there are chic coffee shops on every corner. Coffee is a very personal choice to many people, some like a darker roast, other like ones with more subtle flavours. Instead of just going to the grocery store to buy some beans, I would explore the local cafes, almost every coffee shop offers bulk purchase of their own unique roast of beans. I would recommend exploring all the coffee shops in your area and when you find your favourite, ask to purchase a few pounds to return home with you. When you get home you'll be able to brew a little bit of Mexico City in your home. We loved 'Cardinal' in La Condesa who serves up Cosautlan de Carvajal from Veracruz, which has notes of orange and chocolate. Absolutely delicious! Mole is a traditional sauce used in Mexican cuisine made from fruit, chili pepper, nut, and such spices as black pepper, cinnamon, cumin, and chocolate. It’s a very unique flavour and although it might not be for everyone, if you love it, you LOVE it! You'll see (and hopefully you'll also taste) this sauce on street corners and fancy restaurants all over the city! While the mixture might seem like an overwhelming recipe you can actually buy the dried paste in various markets across the city. The best stuff is made from scratch but if you're not an aficionado or have access to all those local ingredients at home, this will do just fine. 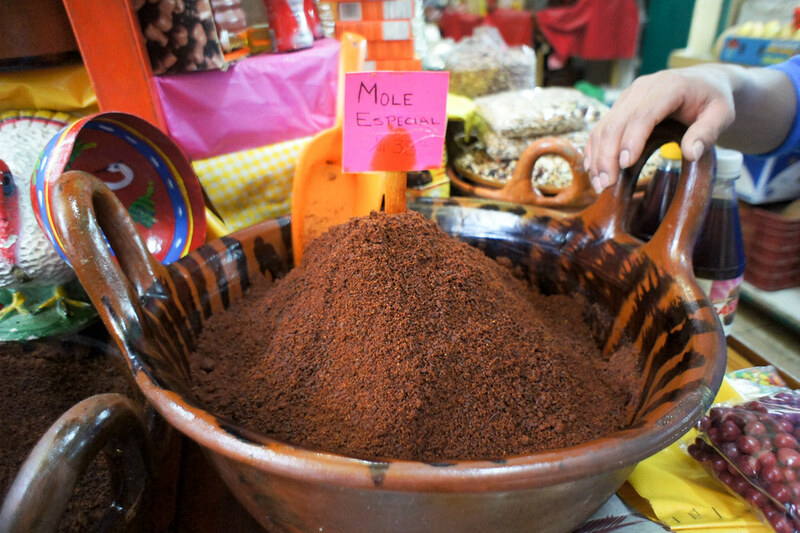 The Coyoacan Market has an incredible section of different mole flavours and was my favourite place to shop for these rich flavours of Mexico City. Happening Store has two locations in Mexico City. They sell a variety of different goods made by local Mexican designers. They have everything from footwear, to jewellery to houseware and soaps. There is definitely a hipster quality to the products sold here but if you're a fan of that kind of stuff then you'll be in heaven! It’s always nice when visiting a city to try and support local, small business and shopping here you’ll find you’re able to explore a variety of designers right in one place! Cafebrería El Péndulo is a magical little place where you can explore all different literary fantasies. The bookshop was established in 1993, and as the name states, it is a combination of Cafeteria and Bookshop. On the first level is where you'll find hundreds of shelves of books and on the second floor you can sit and enjoy a cup of coffee or a lazy, mid-morning brunch. There are six different locations across Mexico City, each with the same open and luminous architecture and eclectic decoration. If you can't read Spanish it's still worth browsing the store and seeing all the different amazing books, music and art on sale. I loved the selection of notebooks and journals from local artists with that same stunning Mexican colours and design which make this city so enchanting. There is truly something for everyone in this magical city! Let me know what your favourite places are to shop in Mexico City and hopefully I can add them to my list the next time I’m visiting this amazing place.